PYEONGCHANG, South Korea, Feb. 5 (Yonhap) -- An Olympic monument symbolizing the spirit of peace and truce was unveiled in the PyeongChang Olympic Village on Monday. The unveiling ceremony for the Olympic Truce Wall was attended by IOC President Tomas Bach, PyeongChang organizing committee chief Lee Hee-beom, and South Korean Minister of Culture, Sports and Tourism Do Jong-hwan. North Korean IOC member Chang Ung, who arrived in the South on Sunday, and former IOC President Jacques Rogge also attended the event. 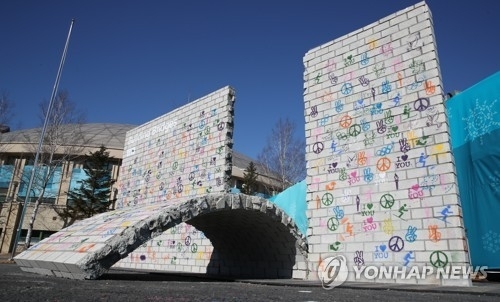 The mural on the wall was designed by South Korean artist Yi Je-seok, who was inspired by Pope Francis' message of peace, namely that building bridges, not walls, encourages relations among people. The idea of the truce wall is inspired by ancient Greece, when conflicts were halted to allow safe travel to and from the original Olympic Games, a practice called an "Olympic Truce." "Given the special circumstances, the time and place of these Olympic Winter Games, it should be clear for everyone why this Olympic Truce is as relevant today as it was in ancient times," Bach said in a speech, apparently alluding to the recent breakthrough in inter-Korean dialogue that lead to the participation of North Korea at the Winter Games in the South. "More than ever, the world needs the Olympic values of peace and friendship," the IOC president added. The IOC has been setting up the monument since the 2006 Turin Winter Games to show its aim of inspiring peace through sport. Lee express hope for the Olympics to serve as catalyst for regional peace. "I sincerely hope that the PyeongChang Olympic Games will pave the way for South and North Koreas to have a peaceful coexistence instead of military tension and to have open exchange and confrontation," Lee said. The mural will be signed by Olympic athletes during the games, which open Friday for a 17-day run. 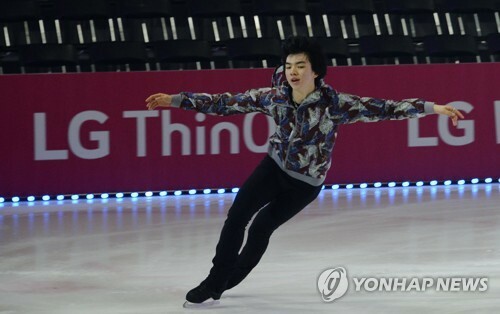 It will later be put on permanent display in PyeongChang as a legacy project of the first Winter Games in South Korea. Over 2,900 athletes from 92 countries will compete for 102 gold medals.